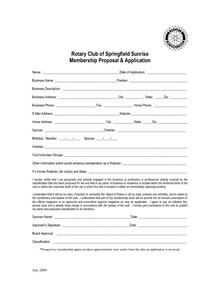 In order to maintain good standing, members must maintain at least 50% attendance Members must attend at least 30% of their home Rotary club’s meetings in each 6 month period. · A definition of a committee meeting-When four of more Rotarians gather to discuss or plan an event or Rotary program. The meeting should be a minimum of 40 minutes and the Chair of the committee should be present. · Minutes of said meeting should be turned into the executive Administrator with a list of all Rotarians present as soon as possible. · Members must attend at least 50% of any given meeting in order to be counted in attendance. Download "2014 IA speech 10-Our Rotary Values.pdf"
Download "Rotary - NEW MEMBER APPLICATION.pdf"